Actor John Dunsworth, best known for his role as the trailer park manager Jim Lahey in the Canadian series Trailer Park Boys and my readers would remember him as Dave Teagues in Haven, passed away yesterday according to his daughter Susan. Dunsworth was a big part of the Nova Scotia acting community, where he was born. Haven‘s Eric Balfour and Fargo series executive producer Warren Littlefield are teaming up to develop a series based on the 2013 novel These Broken Stars from Amie Kaufman and Meagan Spooner (the first book of the Spellbound trilogy). And it’s already received interest from Freeform (formerly ABC Family) and Sky TV. Continuum creator Simon Barry will pen the adaptation, being set up at MGM TV. Also joining the production are Stephanie Varella (Inland Empire), Ann Johnson and Martin Berneman. These Broken Stars follows what happens to the luxury starliner Icarus when it is abruptly ripped from hyperspace and crash lands on a planet, with two survivors: Lilac LaRoux, the daughter of the richest man in the universe, and Tarver Merendsen, who came from nothing but became a young war hero who learned long ago that girls like Lilac are more trouble than they’re worth. But with only each other to rely on, Lilac and Tarver must work together, making a tortuous journey across the eerie, deserted terrain to seek help. Haven: The Complete Fifth Season, Volume 1 out today! Season 5 picks up with the aftermath of our heroes’ victory over William. After having successfully banished him into the Void, Nathan and Duke are devastated to discover that the Audrey Parker they know and love has disappeared. In her place stands Mara, the unflinchingly malevolent “original” person responsible for creating the troubles many centuries ago. Finally freed from the confines of her do-gooder husks (Audrey, Lucy, Sarah, etc. ), Mara proceeds to unleash a wave of chaos over Haven. And don’t forget, Haven returns for the second half of the fifth season on Syfy on October 8th! 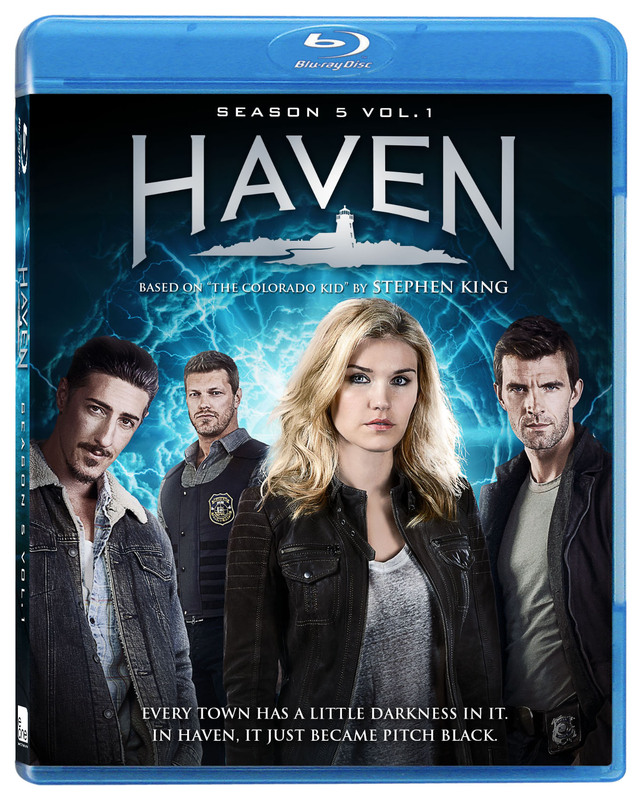 In the meantime, to celebrate both, check out this episode of Inside Haven, with 13 Inside Haven episodes included on the Blu-ray/DVD, along with Haven: Origins: “Witches Are Born”, Haven: Origins: “Native Breaks Free” and audio commentary! Based on the novella “The Colorado Kid” from Stephen King, the hit Syfy series follows former FBI agent Audrey Parker (Emily Rose), who became a cop in the small town of Haven, Maine, and quickly found herself involved in the return of “the Troubles,” a series of supernatural afflictions that have plagued the seaside village for generations. 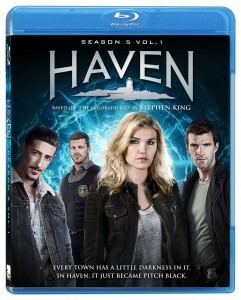 Partnered with local residents Nathan Wuornos (Lucas Bryant) and Duke Crocker (Eric Balfour), Audrey began to realize that Haven’s fate was linked to her own, and only she can save the town and the people she loves from the weight of their curses. We were waiting for the axe to drop, and now it finally has – Syfy has officially canceled Haven after 5 seasons, although 13 episodes remain to air. Syfy had previously said they would wait for the second half of Season 5 to air before making a decision, but when the airing got pushed on the schedule to October, a year after it was filmed, it seemed more and more likely that it would not get renewed. There were a number of factors working against it. Earlier this year the Nova Scotia government voted to significantly cut the film tax credit given to productions in the province, where Haven was filmed. While this may not have been a direct factor, it would have made the cost of production increase even more. Also, production typically took place during the summer, where an ice rink in Chester served as the primary studio, with external shots typically taking place around Chester and Lunenburg. When the double-sized season was ordered last year, it meant that production would extend past their typical August end date into December, and Chester needed their ice rink back. So they used a vacated warehouse in Halifax for the second half. If they continued production at this late date, they would still need an alternate studio location. Plus, contracts for actors, production, storage, etc. only last so long. I was in Nova Scotia this past week, and people were still hopeful production would begin again. Haven brought $28 million to the province and $1 million just for Chester in local spending. Fortunately for fans, as mentioned there are still 13 episodes yet to air and they will starting October 8th. And if there is never to be more Haven, they will wrap things up nicely, but the door is still open…TheWrap has a nice interview with showrunner Gabrielle Stanton about the ending. And fans have already started #SaveHaven in the hopes more can be done. Update 8/5: We can confirm that the premiere date will be October 8th at 10/9c! You can see the interesting promo below. Now what are the chances Syfy renews Haven and goes into production within one week so I can visit my friends when I am up there? In the mid-season finale of Haven this Friday, Nathan and Audrey devise a plan to stop Mara once and for all. Check out the preview for “Chosen” below, plus the latest “Inside Haven“, and don’t forget to tune it at 7/6c on Syfy Friday and tweet with #Haven5! It maybe Thanksgiving weekend, but there is still a new Haven and Z Nation on tonight! Check out the previews below, then tune to Syfy tonight at 7/6c for Haven “Chemistry” and Z Nation “Murphy’s Law”! The Shat hits the fan next year on Haven! William Shatner (Star Trek) is set to guest star in a four-episode arc on the Syfy fan-favorite series in 2015. Shatner will play a pivotal character that has the potential to forever impact the fate of the town of Haven and its troubled residents. This year, Haven (airing Fridays at 7PM ET/PT), barrels towards its game-changing mid-season finale with the last two episodes of 2014. There’s more Haven to come as the series returns to Syfy in 2015 with 13 all-new episodes. Shatner, Reso, Laura Mennell (Alphas) and Kris Lemche (Joan of Arcadia) are among the guest stars to be featured when the series returns next year. On Friday’s Haven, a new threat forces Duke and Audrey to seek help from potentially dangerous allies. Check out this sneak peek for “Reflections”, plus the latest “Inside Haven“, and tune in Friday at 7/6c – and don’t forget to tweet during the show using the hashtag #Haven5! On Friday’s Haven, Dr. Cross could expose Haven’s secrets to the outside world, but does she have her own agenda? Tune in for “Mortality”, tomorrow night at 7/6c on Syfy!